Bret Michaels has created his own rockin’ pet collection, Pets Rock, available exclusively at PetSmart. From pet beds, collars, leashes and toys, to adorable outfits, there’s everything you need to have the fiercest pet! Product received for review. Post contains affiliate links. I absolutely adore everything in this collection. 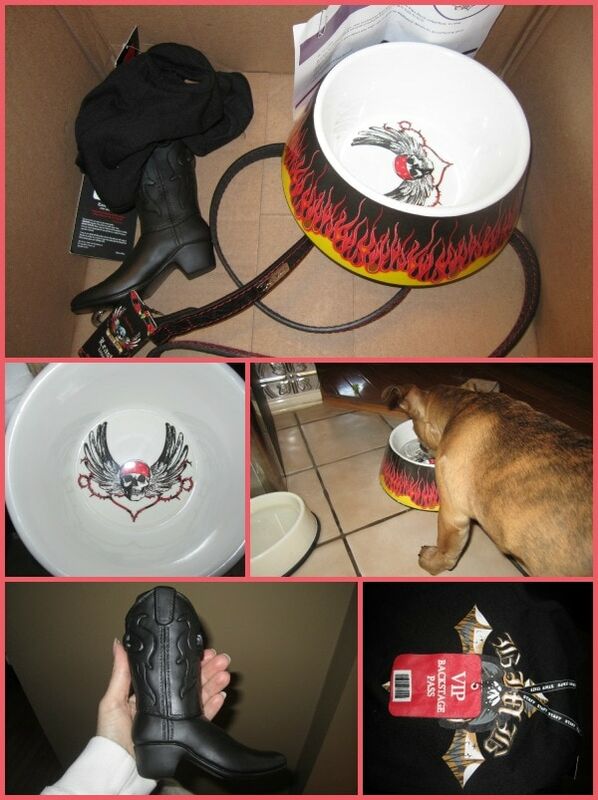 We received four items for review: Bret Michaels Pets Rock™ VIP Tee, Bret Michaels Pets Rock™ Melamine Bowl w/Flames, Bret Michaels Pets Rock™ Vinyl Boot, and Bret Michaels Pets Rock™ Embossed Leather Lead. Each item is high quality and just too cute. I think the prices are pretty affordable, too. It’s so funny that whenever I receive something for the pets they seem to know it. As soon as our guys saw the box they got super excited. How they can sense that there’s goodies in there for them is beyond me. Right away both pups went nuts over the squeaky boot toy! They also both headed for their new water dish once it was filled. We love having another one since it’s been so hot it’s nice to have water bowls all over the house. The Grump got to rock out in his VIP tee. He looked super official and seemed to feel that way, too. The leather lead is awesome. It’s thick, sturdy and stylish. The embossed thorn and vine detail makes it extra sharp. We are able to use it with either dog. It’s the perfect length, too. If you enjoy spoiling your pets with fun products, I suggest heading to your nearest PetSmart or shopping online to checkout this collection. PetSmart is our new favorite pet store. We find everything we need there and it’s all more affordable. Plus, you can bring your dogs with you and meet others there. It’s so fun! I love the Bret Michaels Pets Rock™ Tour Bus Toy w/Hide Seek Toys!! I want to enter sooooo bad this stuff is awesome and I like Brett and grumpy looks great in his shirt:) But I’m in Canada so I am out of luck! I like the plush animal with squeaker. My little pug would love the Rock™Plush Cow Toy w/Rope. So cute! 🙂 Thank you. Everything is so cool. But I love the Roses bowl….. I like the Bret Michaels Pets Rock™Plush Cow Toy w/Rope. I think my 2 labs would enjoy playing with this. I like the bret michaels plush guitar the most, i think. I like the plush fox toy and more. I like the guitar and skull large pet bed. The Bret Michaels Pets Rock™ Tour Bus Toy w/Hide Seek Toys! How adorable! 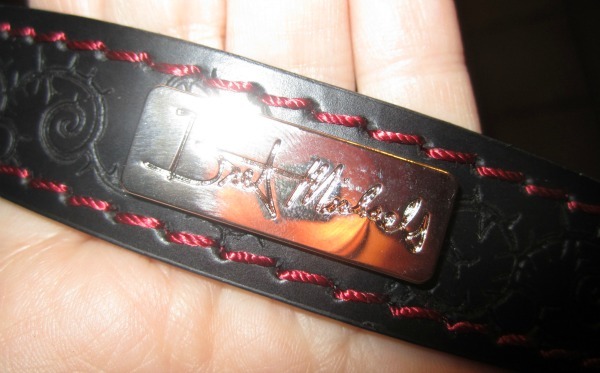 I really like The Bret Michaels Pets Rock Embossed Leather Collar! It is so cute! Bret Michaels Pets Rock Skull & Roses Pet Carrier! Love it! I like the Bret Michaels Pets Rock™ Plush Animal w/Squeaker! My favorite toy is the plush cow toy with rope. The rubber spiked rings from Bret Michaels’ collection is pretty cool. Bret Michaels Pets Rock Plush Cow Toy w/Rope. I think my dog would really enjoy that. I like the Rubber Spiked Ring! I like the Tour Bus Toy w/Hide Seek Toys. My dog loves toys that make him think. Lov ethe plush fox toy! My favorite is the Bret Michaels Pets Rock™ Plush Guitar Toy w/Rope. my favorite toy is the Bret Michaels Pets Rock™ Tour Bus Toy w/Hide Seek Toys! I love the Bret Michaels Pets Rock™ Tour Bus Toy. i luv the tour bus!!! I like the Spiked Rubber Ball w/Bandana. i liked the bret michaels pets rock plush animal with squeaker. I like the tour bus toy. I like the Bret Michaels Pets Rock™Plush Cow Toy w/Rope. I love the plush fox toy.I love all of this collection cause Brett Michael’s is the best. My dog would love the Bret Michaels Pets Rock Plush Cow Toy with Rope. I love the Bret Michaels Pets Rock™ Melamine Guitar Bowl and for a toy, the guitar. ok i like the jeans tee!